There was a time when, if you wanted to know what condition your properties roof was in you had two choices. Get a set of ladders and go up there yourself or trust a roofer to tell you. Thanks to modern technology, there is now a third way that is far quicker, more reliable, safer and with potential real cost savings. UAV / Aerial Drones can be used for aerial inspection of your residential or commercial properties roof and its current condition. Balmore Aerial Services is a Glasgow based aerial drone firm that provides class leading aerial inspection and survey services for commercial and residential customers alike across all of Scotland and the North of England. If you want to know the current condition of your roof then when you call on Balmore, you get access to our fleet of aerial drones, equipped with the latest in 4K HD image capturing and video capturing technology along with Thermal Imaging cameras. It means that we can quickly and easily conduct a survey inspection of your properties roof and report back to you in real time if there are any issues. With the 4K camera, we can capture in great detail areas of your roof that would be either too difficult to access or too dangerous and it can all be recorded in high definition to be reviewed as often as you would like. With our thermal imaging technology, we can go beyond simply supplying pictures and videos. We can go deeper. With thermal imaging, we can analyse where there is any heat loss and water leak/access that the naked eye simply can’t see. It is these potential issues that when caught early, can save you thousand in potential roof damage costs in the future. The significant benefits in using aerial drones to conduct roof condition surveys and inspections are why they are becoming so popular for both commercial and residential application. As a fast and cost effective way of surveying a roof, you can view visible evidence of its current state. No longer do you have to rely on the word of the roofer who popped up the ladders to have a look around. Our areal drones can provide complete coverage of your properties roofing, chimneys and drainage and as a fully licensed and insured drone service provider, you can rest assured that you are in safe hands with Balmore Aerial Services. 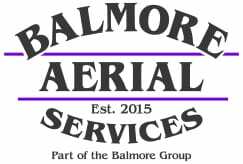 Balmore Aerial Services is part of the overall Balmore Group, a collection of companies that allows us to offer a truly unique ‘one stop shop’ for all your inspection, repairs and cleaning maintenance. Part of this same group is Balmore Specialist Contracts who’s core focus is on roofing and building maintenance and repairs. It means that we have access to a professional roofing service who can review the aerial drone survey of your roof and provide a complete report on the inspection video. It is all part of our core mission to be able to offer a complete and professional service to our customers who demand the best in both quality and service. It is why we constantly reinvest in both our team and the equipment that we use and it is why we have grown to become one of the UK’s leading drone inspection services.